Ingredients for cooking Cauliflower Cheese This is an old favourite, and seems to work well with many main courses, including Roast Chicken. I prepare this one a lot at home. Put the cauliflower into a big saucepan with a tightly-fitting lid. Add enough cold water to come half-way up the florets - about half a pint. Add half a teaspoon of salt. Bring the water in the pan to the boil, and cover; simmer for 5 minutes only - the cauliflower should be not-quite-cooked at this point. Drain off the water used for cooking into a jug - you will need this to make the sauce. 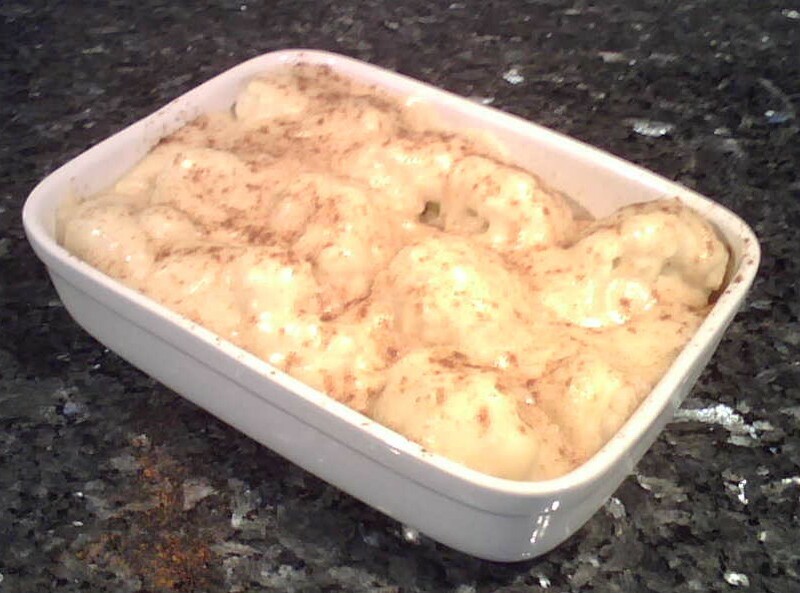 Tip the part-cooked cauliflower into a ceramic ovenproof dish. Now for the sauce. I prefer to use a wheat-free recipe here, since Tracey tends to react badly to wheat products. In a small saucepan, mix three ounces of grated cheese with a splash of milk and some freshly-ground black pepper. I like to add a teaspoon of english mustard (bright yellow!) which adds bite and colour to the result. Add about a quarter-pint of the liquid used to cook the cauliflower. Warm the mixture, stiring continuously to allow the cheese to melt. Dissolve three heaped teaspoons of cornflour in a little cold water in a separate container - I tend to use a small mug for this purpose. Pour the cornflour mixture into the saucepan, stiring continuously. Bring to the boil and allow to thicken - add more of the cooking liquid as necessary to prevent it from getting too thick. To avoid lumps in the sauce, it is very important to stir hard, all the time! Pour the thickened sauce over the cauliflower in the dish, making sure that every floret is covered. Optionally, sprinkle a little paprika over the top, again to add colour and flavour. Put the completed dish in a pre-heated oven at around 200C (Gas Mark 6) for at least 30 minutes. This can stay in the oven longer, especially on the bottom rack while other dishes are cooking. Serve hot, in the cooking dish.